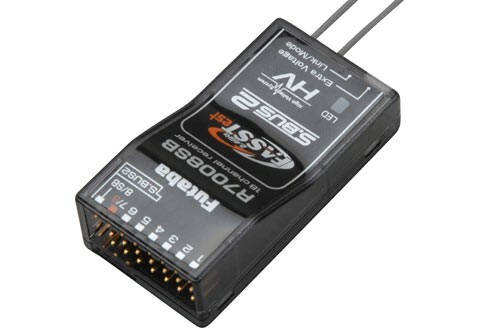 The Futaba R7000SB receiver is a FASSTest telemetry enabled receiver with a high-voltage (3.5 - 8.4 Volts) design which operates up to 8 channels using the standard 8 PWM outputs or up to 18 channels (16 proportional + 2 digital) when using the S-Bus port. The S-Bus option means that setups are simpler and with full support for S-Bus and S-Bus2 servos you can have the best posible options and systems running. The Futaba R7008SB receiver is small at only 24.9 x 47.3 x 14.3 mm's and lightweight, it is only 10.9 grams. Includes in the R7000SB is an integral sensor for receiver voltage, signal strength and external voltage, with further sensors available separately for additional telemetry information from your aircraft when used with the Futaba 14SG Radio Combo with R7008SB Receiver (Mode 2). This is a great product, delivered promptly as usual from Build Your Own Drone. Thank you.